Home > Resources > Blog > 2018 Blog Posts > Save the Date! The 13th Annual Cascade CMS User Conference is Coming! We love interacting with clients, and there’s no better time or place to do so than at the Cascade CMS User Conference. It’s where customers come to meet other leaders, learn more about Cascade CMS, and, most importantly, have an awesome time. We’re so excited to share some of the details for this year’s event. What’s Happening with the User Conference? 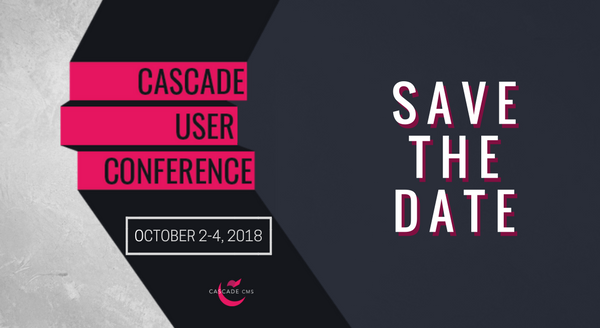 Each Fall, we invite our customers to the annual Cascade CMS User Conference, or, as we like to call it, #CUC18. This year's event is slated to be the biggest and best to date, and we look forward to seeing you there! #CUC18 is an opportunity to gain critical knowledge about Cascade CMS. Your peers will share best practices, lessons learned, and show you how they use Cascade CMS to solve common problems. Hannon Hill product engineers, service consultants, and support staff will be available to answer questions, listen to feedback, and learn more about your organization’s needs. #CUC18 will also feature informative workshops, fun social events, and a peek at what’s next for Cascade CMS. We cannot wait for this year’s event and know that it won’t be the same without you. Complete the form below to get automatic updates about #CUC18. You’ll receive information about social events, hotel offers, and what to do in Atlanta when you’re not having fun at #CUC18.